CLICK HERE TO READ "WATER TALK"
a smile and a sense of humor! Don't hesitate to contact us to get started today! *Necessary forms can be obtained in advance by visiting our downloads page . 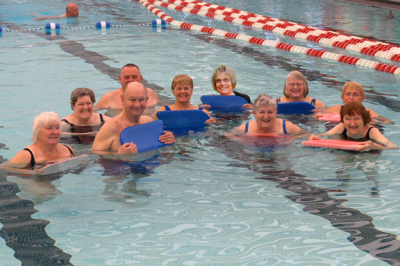 Our faciity accomodates both Group classes and lap swimming. Visit our Classes Page for a list of offerings. We like the old adage "Laughter is the best medicine" and we pride ourselves on prescribing healthy doses to all our members!